Abell, Steven and Dauphin, Barry 2009. The Perpetuation of Patriarchy: The Hidden Factor of Gender Bias in the Diagnosis and Treatment of Children. Clinical Child Psychology and Psychiatry, Vol. 14, Issue. 1, p. 117. Alem, Atalay Jacobsson, Lars Lynöe, Niels Kohn, Robert and Kullgren, Gunnar 2002. Attitudes and practices among Ethiopian health care professionals in psychiatry regarding compulsory treatment. International Journal of Law and Psychiatry, Vol. 25, Issue. 6, p. 599. Lowe-Ponsford, Francesca 2000. Russian Forensic Psychiatry. Medicine, Science and the Law, Vol. 40, Issue. 1, p. 28. Kullgren, G. Jacobsson, L. Lynöe, N. Kohn, R. and Levav, I. 1996. Practices and attitudes among Swedish psychiatrists regarding the ethics of compulsory treatment. Acta Psychiatrica Scandinavica, Vol. 93, Issue. 5, p. 389. Becker, Hinnerk and Zeiler, Joachim 1995. Actual trends in Russian psychiatry. Journal of Public Health, Vol. 3, Issue. 4, p. 349. Fulford, K. W. M. Smirnov, A. Y. U. and Snow, E. 1993. 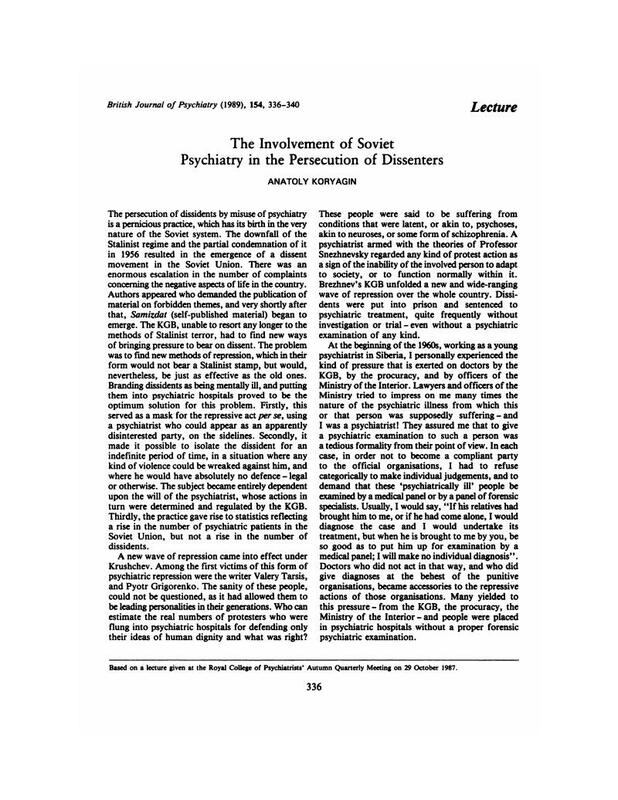 Concepts of Disease and the Abuse of Psychiatry in the USSR. British Journal of Psychiatry, Vol. 162, Issue. 06, p. 801. Coles, E. M. and Grant, F.E. 1991. The Role of the Psychiatrist in Dangerous Offender Hearings. The Canadian Journal of Psychiatry, Vol. 36, Issue. 7, p. 534. Based on a lecture given at the Royal College of Psychiatrists' Autumn Quarterly Meeting on 29 October 1987.